By Mateusz Mucha, James Mathison and Dominik Czernia - PhD candidate. This velocity calculator is a comprehensive tool that enables you to estimate the speed of an object. If you have ever wondered how to find velocity, here you can do it in three different ways. The first one relies on the basic velocity definition that uses the well-known velocity equation. The second method calculates what is velocity change caused by acceleration over a specific time interval. 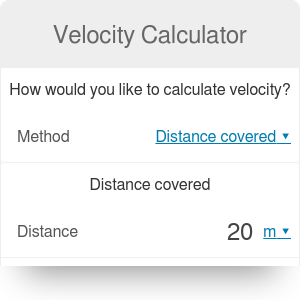 Finally, the third part of the velocity calculator makes use of the average velocity formula, which may be useful if you need to analyze journeys with various velocities over different distances. We've also prepared a brief but informative article about velocity itself. Keep reading to learn what is velocity formula and what are the most common velocity units. Did you know that there is an essential difference between speed vs velocity? We've written about it from the point of view of a physicist in the text below. Keep in mind that this velocity formula only works when an object has a constant speed in a constant direction or if you want to find average velocity over a certain distance (as opposed to the instantaneous velocity). You have probably noticed that we use words speed and velocity interchangeably, but you can't do it every time. To learn more about it, head to the speed vs velocity section. Aside from the linear velocity, to which we devoted this calculator, there are also other types of velocity, such as rotational or angular velocity with corresponding physical quantities: rotational kinetic energy, angular acceleration or mass moment of inertia. When an object has only angular velocity, it doesn't displace (the distance is zero), and you can't use the average velocity formula. You should use the average velocity formula if you can divide your route into few segments. For example, you drive a car with a speed of 25 mph for 1 h in the city and then reach 70 mph for 3 h on the highway. What is your average velocity? With the velocity calculator, you can find that it will be about 59 mph. From the above equations, you can also imagine what are velocity units. British imperial units are feet per second ft/s and miles per hour mph. In the metric SI system the units are meters per second m/s and kilometers per hour km/h. Remember you can always easily switch between all of them in our tool! The relationship between distance and time is also needed when estimating the fuel use of your car. In order to calculate how much gas will be used during a particular journey, try our gas calculator . Before we explain how to calculate velocity, we'd like to note that there is a slight difference between velocity and speed. The former is determined on the difference between the final and initial position and the direction of movement, while the latter requires only the distance covered. In other words, velocity is a vector (with the magnitude and direction), and speed is a scalar (with magnitude only). Divide the distance by time: velocity = 500 / 180 = 2.77 m/s. Let's try another example. You want to participate in a race with your brand new car that can change its speed with an acceleration of about 6.95 m/s². The competition just started. What will be your velocity after 4 seconds? Set initial velocity to zero, you're not moving at the beginning of the race. Multiply the acceleration by time to obtain the velocity change: velocity change = 6.95 * 4 = 27.8 m/s. Since the initial velocity was zero, the final velocity is equal to the change of speed. You can convert units to km/h by multiplying the result by 3.6: 27.8 * 3.6 ≈ 100 km/h. You can, of course, make your calculations much easier by using the average velocity calculator. All you'll need to do is type in distance and time. One of the advantages of using this calculator is that you don't have to convert any units by hand. Our tool will do it all for you! Remember that you can't race everywhere, normal roads and highways are not built for super high speeds! Check out the car crash calculator to see how dangerous automobile collisions can be. Be sure to not drive after drinking alcohol and inspect your car regularly. Velocity is present in many aspects of physics, and we have created many calculators about it! The first velocity is the so-called terminal velocity, which is the highest velocity attainable by a free falling object. Terminal velocity occurs in fluids (e.g., air or water) and depends on the fluid's density. You can read more about it in our free fall with air resistance calculator. Knowing how to calculate velocity is of particular importance in astrophysics since results have to be very accurate. If you're interested in the world of massive celestial objects like suns or planets, visit our escape velocity calculator or orbital velocity calculator. You can learn a lot there! In the high energy region, there is another important velocity - relativistic velocity. It results from the fact that no object with a non-zero mass can reach the speed of light. Why? When it approaches light speed, it's kinetic energy becomes unattainable, very large or even infinite. You can check it with the relativistic kinetic energy calculator by filling the velocity field with the speed of light 299,792,458 m/s or 2.998e8 m/s in scientific notation. Moreover, this is a cause of other phenomena like relativistic velocity addition, time dilation, and length contraction. Also the Albert Einstein's famous E = mc2 formula bases on the relativistic velocity concept. I hope we've convinced you that velocity plays an essential role in everyday life and not just science, and we hope that you've enjoyed our velocity calculator. Feel free to explore our other calculators. It may be surprising, but there are many more of them connected with velocity that we didn't mention, have an explore! Mateusz Mucha, James Mathison and Dominik Czernia - PhD candidate. Velocity Calculator can be embedded on your website to enrich the content you wrote and make it easier for your visitors to understand your message.